Giselle R. Rodriguez Hologic Scholarship recipients Kailyn Palaima (second from left) and Alysha McGovern (fourth from left) gather with representatives of Hologic, Inc.: (l to r) Brenda Geary, regulatory affairs specialist; Anne Liddy, assistant general counsel, Joyce Bourgeois, senior paralegal, and Mike Carenzo, assistant general counsel. 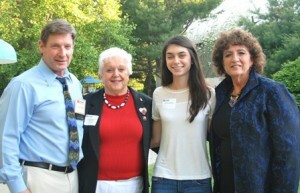 Marlborough – Marlborough Regional Chamber of Commerce (MRCC) members met with families of college-bound students June 4 for the annual Scholarship Night at Wayside Racquet & Swim Club. The presentation was emceed by Darren McLaughlin, who serves multiple roles. 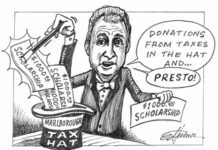 He’s the general manager of Wayside, president of Marlborough Regional Community Foundation (MRCF), and chair of MRCC’s Scholarship and School to Business committees. 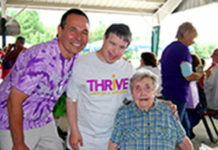 The evening barbecue was sponsored by Hologic, Inc., a Marlborough-based developer, manufacturer and supplier of products with an emphasis on women’s healthcare needs. 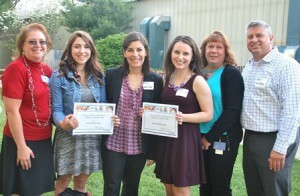 This year they presented the Giselle R. Rodriguez Hologic Scholarship for $2,000 to two Marlborough High School (MHS) graduates: Alysha McGovern and Kailyn Palaima. Through MRCF, MRCC awarded $1,000 scholarships to Andressa Andrade of Marlborough, Marian High School; Allison Caufield of Leominster, Advanced Math and Science Academy; Ryan Keen of Marlborough, Assabet Valley Regional Technical High School (AVRTHS); Ngam Kim Phan, MHS; and Rachel MacMunn, Hudson High School. Wayside presented two scholarships totaling $1,500 to MHS graduates Christopher Demers and Trevor Parrinello. 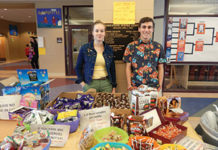 Also acknowledged were the recipients of the second Catherine Gregory Mogavero Business and Professional Association Award: AVRTH senior Andre Colleoni-Pimenta and MHS senior Katie Godere. The scholarship presentations began with 2015 MHS graduate Lauren Fay singing “The Star-Spangled Banner.” Jazz music was provided by Wombo Combo consisting of Connor Bailey, trumpet; Shawheen Fagan, bass; Jordan Hanahan, drums; Sarah Hanahan, alto saxophone; and Alex Sutton, guitar. To further help the cause, the 21st annual Run/Walk for Fun to benefit the MRCC Scholarship Fund will be held Wednesday, June 17, beginning and ending at Wayside. Same-day registration begins at 5 p.m.; the run/walk begins at 6:30 p.m. Advance registration is available online at firm-racing.com. 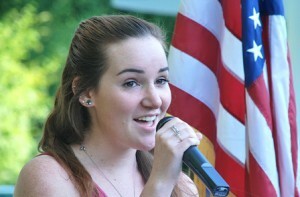 “The Star-Spangled Banner” is sung by 2015 Marlborough High School graduate Lauren Fay. 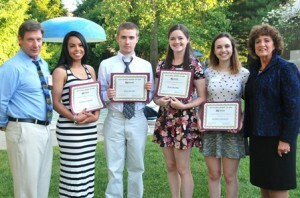 (l to r) Darren McLaughlin, Marlborough Regional Community Foundation president, joins scholarship recipients Andressa Andrade, Ryan Keene, Rachel MacMunn and Allison Caufield, and Susanne Morreale Leeber, Marlborough Regional Chamber of Commerce president and CEO. Not pictured is scholarship recipient Ngam Kim Phan. Darren McLaughlin, Wayside Racquet & Swim Club general manager, (center) joins scholarship recipients (l to r) Christopher Demers and Trevor Parrinello, Marlborough High School graduates. 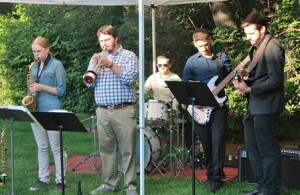 Entertaining guests are Wombo Combo musicians (l to r) Sarah Hanahan, Connor Bailey, Jordan Hanahan, Shawheen Fagan and Alex Sutton. Catherine Gregory Mogavero Business and Professional Association Award recipient Katie Godere gathers with (l to r) Darren McLaughlin, Marlborough Regional Chamber of Commerce (MRCC) School to Business Committee chair; Cathy Mogavero, former MRCC executive vice president; and Susanne Morreale Leeber, MRCC president and CEO. Not pictured is scholarship recipient Andre Colleoni-Pimenta.